The SAHB Times is edited by Malcolm Bobbitt, and is published four times a year, in colour and usually with 40 pages. It is supplied gratis to members. 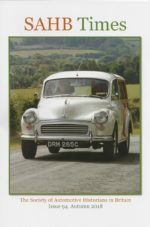 The magazine is highly informative and outlines, not only details about forthcoming events and seminars, but also includes interesting colour photographs and short articles about motoring subjects, and correspondence from members. ‘Chairman’s Comments’, and much more.